If your knee is severely damaged by arthritis or injury, it may be hard for you to perform simple activities, such as walking or climbing stairs. You may even begin to feel pain while you are sitting or lying down.If nonsurgical treatments like medications and using walking supports are no longer helpful, you may want to consider total knee replacement surgery. Joint replacement surgery is a safe and effective procedure to relieve pain, correct leg deformity, and help you resume normal activities. Knee replacement surgery was first performed in 1968. Since then, improvements in surgical materials and techniques have greatly increased its effectiveness. 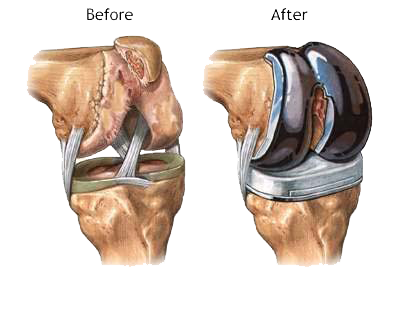 Total knee replacements are one of the most successful procedures in all of medicine. According to the Agency for Healthcare Research and Quality, more than 600,000 knee replacements are performed each year.shoulder replacement surgeon in Nashik. The most common cause of chronic knee pain and disability is arthritis. Although there are many types of arthritis, most knee pain is caused by just three types: osteoarthritis, rheumatoid arthritis, and post-traumatic arthritis. Osteoarthritis: This is an age-related “wear and tear” type of arthritis. It usually occurs in people 50 years of age and older, but may occur in younger people, too. The cartilage that cushions the bones of the knee softens and wears away. The bones then rub against one another, causing knee pain and stiffness. Post-traumatic arthritis. :This can follow a serious knee injury. Fractures of the bones surrounding the knee or tears of the knee ligaments may damage the articular cartilage over time, causing knee pain and limiting knee function. A knee replacement (also called knee arthroplasty) might be more accurately termed a knee “resurfacing” because only the surface of the bones are actually replaced. There are four basic steps to a knee replacement procedure. Prepare the bone. The damaged cartilage surfaces at the ends of the femur and tibia are removed along with a small amount of underlying bone. Position the metal implants. The removed cartilage and bone is replaced with metal components that recreate the surface of the joint. These metal parts may be cemented or “press-fit” into the bone. Resurface the patella. 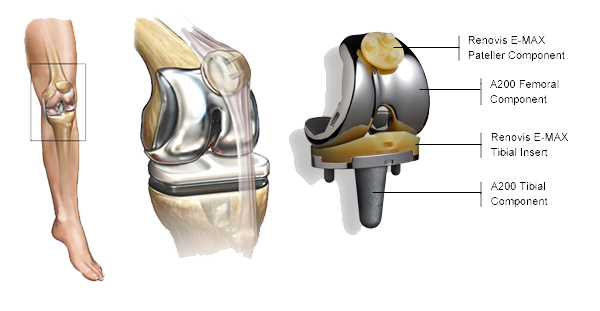 The undersurface of the patella (kneecap) is cut and resurfaced with a plastic button. Some surgeons do not resurface the patella, depending upon the case. Insert a spacer. A medical-grade plastic spacer is inserted between the metal components to create a smooth gliding surface. There are no absolute age or weight restrictions for total knee replacement surgery. Recommendations for surgery are based on a patient’s pain and disability, not age. Most patients who undergo total knee replacement are age 50 to 80, but orthopaedic surgeons evaluate patients individually. Total knee replacements have been performed successfully at all ages, from the young teenager with juvenile arthritis to the elderly patient with degenerative arthritis. Dr. Rajesh Rajule is a consultant orthopedics, joint replacement and arthroscopy surgeon. He has special interest in Artroplasty, arthroscopy and sports medicine. He has been trained in prestigious hospitals in India.